Fantastic setting with good food, just don't have the roast! 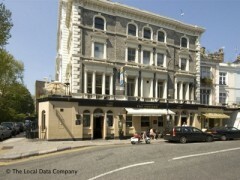 About: The Queens is a gastro pub with a restaurant serving modern English food and Jazz playing in the background. They have terrace seating and offer a private party facility for up to 30 guests upon request. "Fantastic setting with good food, just don't have the roast!" We’re not local to Primrose Hill, however coming out of Chalk Farm tube station and walking the short distance along Regents Park Road to arrive at The Queens we could easily see why it is such a popular neighbourhood. On this Sunday during the late May Bank Holiday weekend the pavements were buzzing with locals visiting the many delis, restaurants and boutiques which line the street. Upon arrival at The Queens we made our way to the first floor restaurant, we were welcomed into a very pretty and bright dining room. There is an attractive open kitchen at one end, and a small terrace at the other, which no doubt is incredibly popular on a sunny day. We were seated by the window and our order taken for an expertly mixed Bloody Mary (£4.50). The menu was concise and the main courses perhaps not as ‘summery’ as I would have liked but it all sounded delicious nevertheless. I decided on the Smoked salmon, lemon and caper dressing (£6.00) starter which was nicely presented, a generous portion with some delicious dressed salad leaves. My partner chose the Asparagus and roasted pepper tart (£5.75) which he enjoyed, the flavours of the roasted peppers really shining through. For main I settled on the Pan-fried whole mackerel, crushed new potatoes, wilted spinach and chive sauce (£11.00) which was also good, the mackerel could have done with some seasoning however the accompanying sauce made up for this. Our waitress was very friendly and specifically recommended the Sunday roast, my partner decided to heed her advice choosing the Roast sirloin of Hereford beef, Yorkshire pudding, duck fat roast potatoes, vegetables (£13.50). Sadly it proved to be the one sour note of an otherwise very pleasant lunch. Having asked for the beef to be served medium rare it arrived very much well done, in fact when we called the waitress over she immediately recognised that it was overcooked and whisked the plate away with an apology. The second attempt was more successful in terms of the roast beef, but we found the roast potatoes very dry and the accompanying vegetables nothing special. All in all a bit of a disappointment particularly as it had been specially recommended. To go along with our lunch we choose a bottle of Chablis which at £27.00 was one of the more expensive bottles of wine on the menu however well worth the extra cost and delicious, particularly on a sunny afternoon. We decided against a dessert and instead savoured every last drop of our mouth-watering bottle of chilled white wine! Overall we thoroughly enjoyed our lunch at The Queens, and will definitely go back if we find ourselves in the neighbourhood.